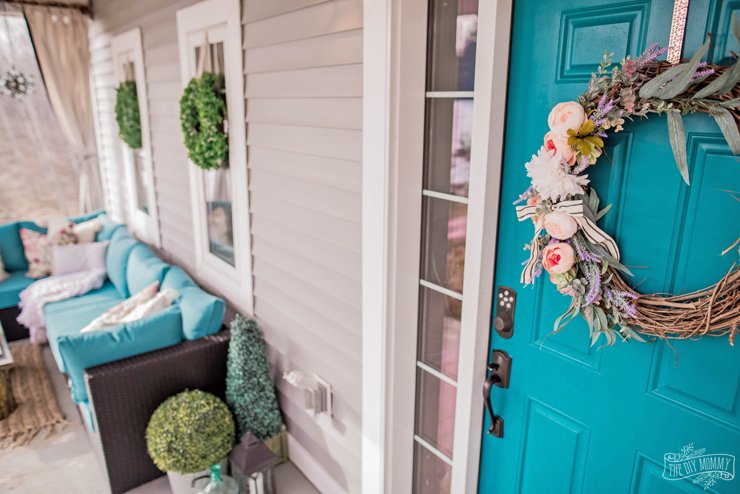 Our 2019 Porch Decor with DIY Ideas for Spring! 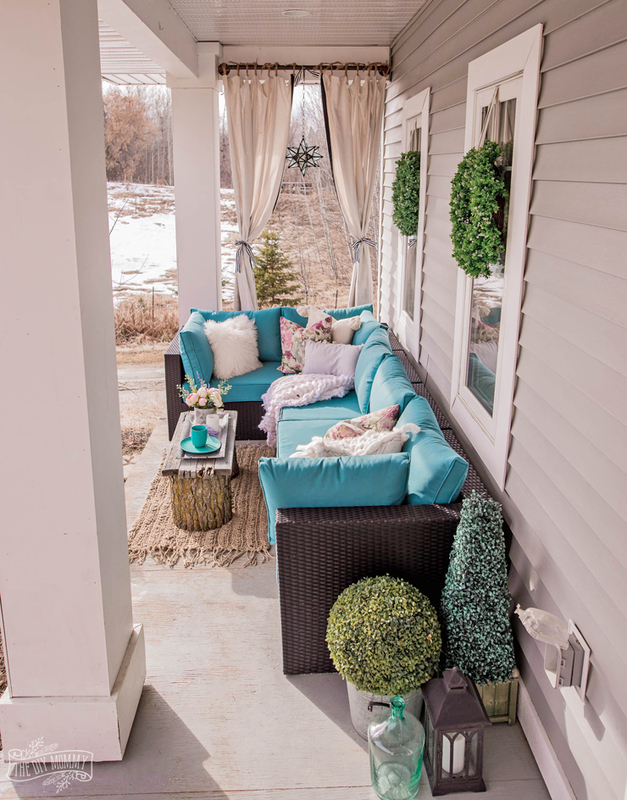 Come take a tour of our newly refreshed front porch all decorated for Spring! 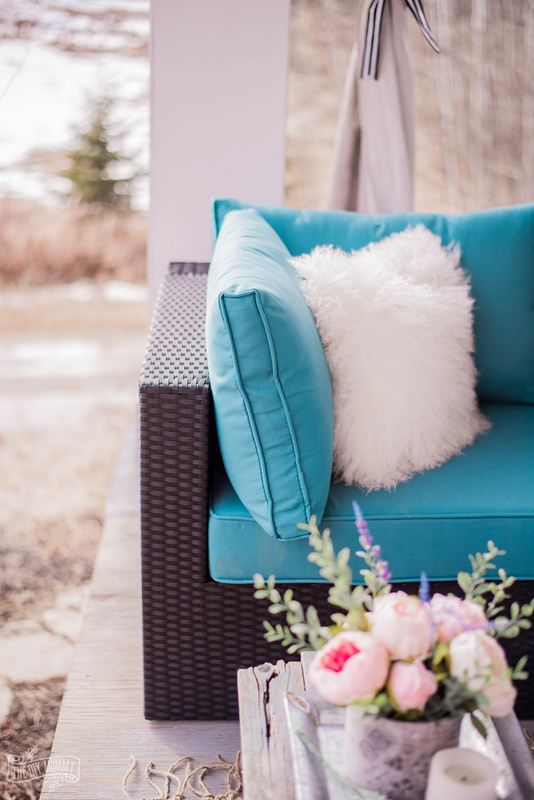 See how I styled a bold coloured sectional, and get tons of DIY ideas for your outdoor space this season. 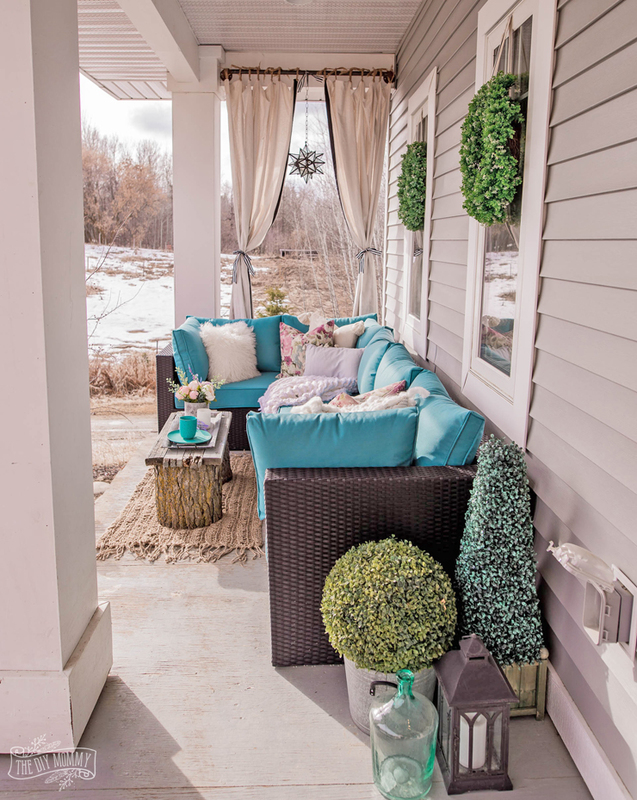 We may still have a few patches of snow on the (brown) ground, but that doesn’t mean I can’t start decorating our porch for Spring! I’m such a warm weather girl, and after surviving the coldest February I’ve ever known (literally – it was the coldest we’ve had in 40 years), I’m itching to spend time outside in the warmer temps. 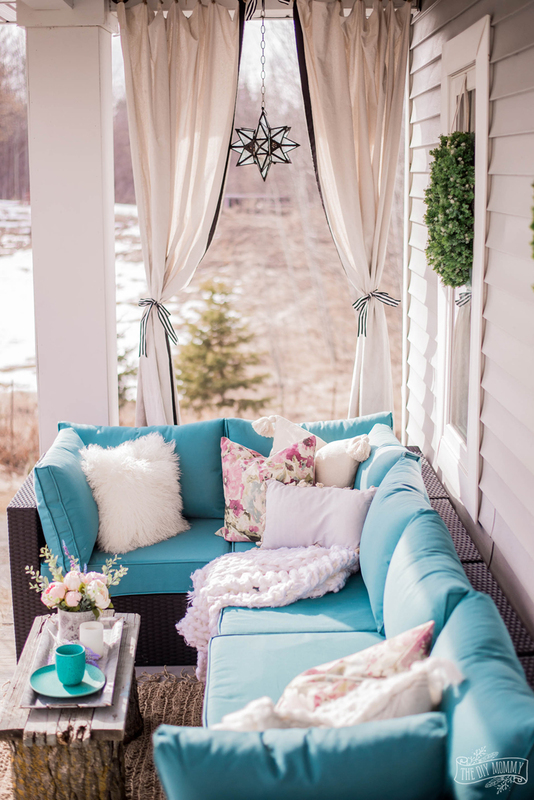 When I saw this stunning teal blue outdoor sectional on The Brick’s website, it inspired me to give our whole front porch a refresh just in time for Spring! I had a feeling it would match our front door… and then when the sectional was delivered and I saw the cushion covers, I was SO excited! 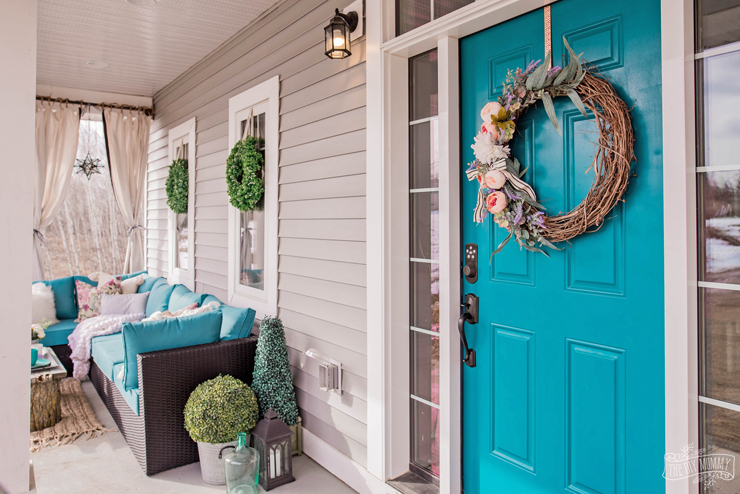 They were an exact match to our brilliant teal front door. This piece is the Minnesota 5-Piece Patio Sectional in Blue from The Brick, and we are so happy with it. It has the most gorgeous colour of cushions (it also comes in a calming beige colour if you prefer neutrals), and it’s modular so you can divide all the pieces up however you wish. Once we get the other side of our porch looking decent I may move some of the pieces over there, but I do love it all as one comfy sectional! 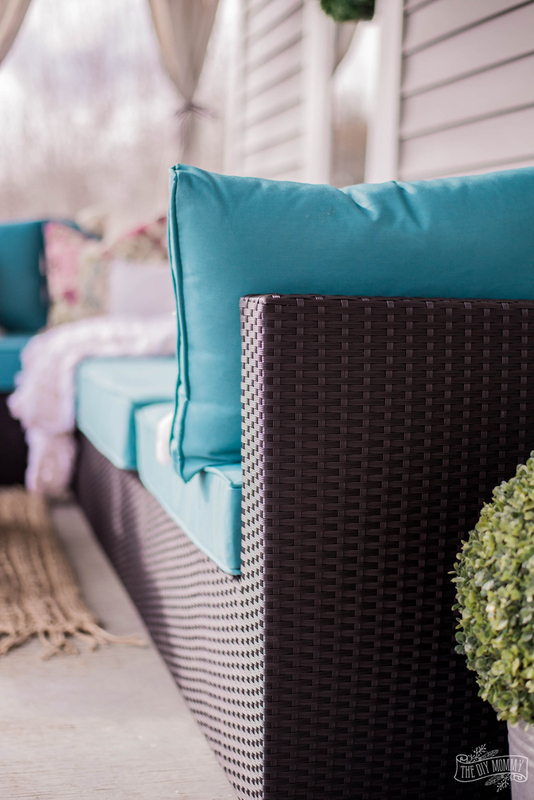 The frame is a resin wicker, so it’s very low maintenance and easy to wipe down as needed. I really like the charcoal colour of the frame against all the grey tones of our home. 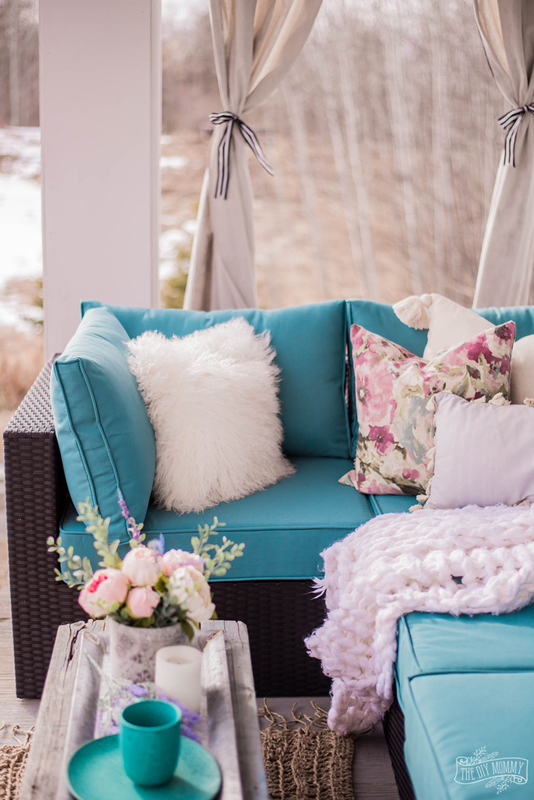 A whole flock of pillows gives our new outdoor sectional more comfort and style. 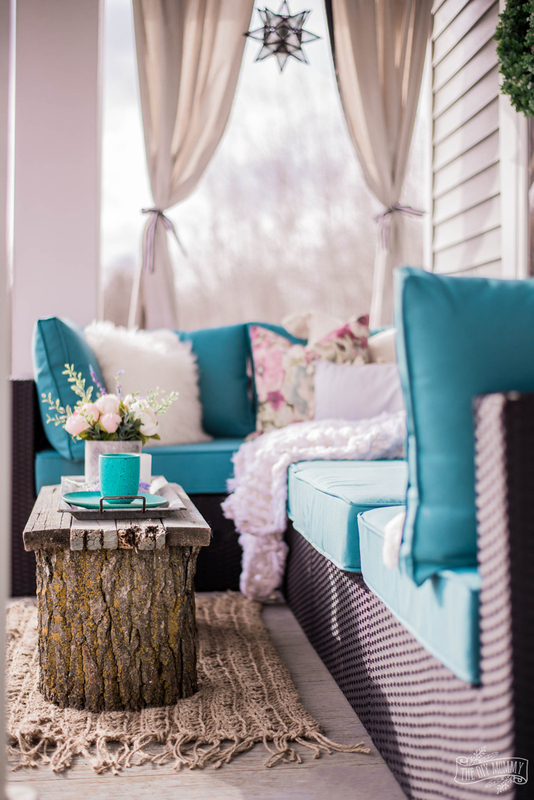 (Read here on how I maintain and clean our porch décor and accessories.) 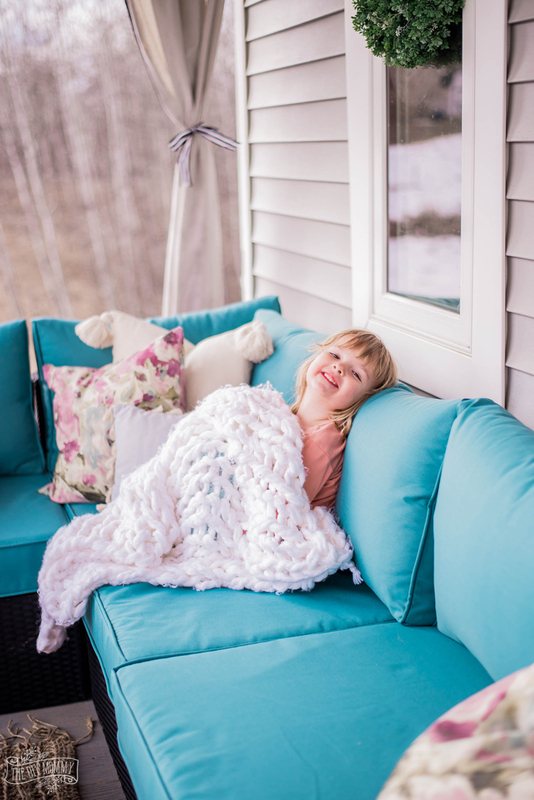 The floral pillows are a DIY with this easy method, and the fur pillow is this one from The Brick. The drop cloth curtains and DIY pipe curtain rod are also DIYs that I’ve loved creating, and you can find that tutorial here. 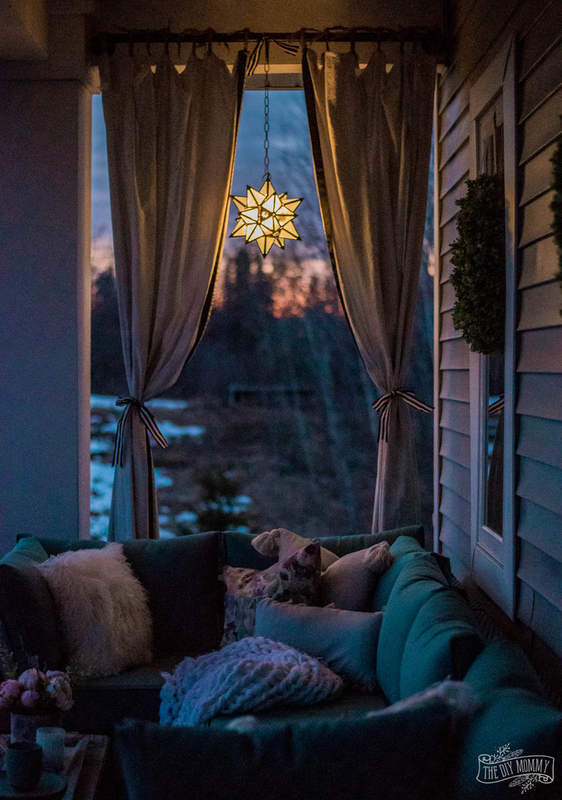 I threw them in the wash to refresh them for this year, and hung an old lantern in the center of the rod with string lights inside for a warm glow at night. Another fun DIY? This jute rug is hand crocheted and it didn’t take long at all! Find the whole tutorial right here. It’s the perfect rustic base for my handmade bench from stumps and reclaimed wood that I’m using as a coffee table! Are you dealing with lots of brown & grey tones outside right now like I am? It’s too early for real plants here, but I brought some greenery and floral elements in with a simple DIY wreath on our front door and some faux boxwood. I really like the look of faux boxwood, and I found these topiaries at The Brick in store. We’ll soon start some Spring planters, but for now I love how the boxwood adds some life here! 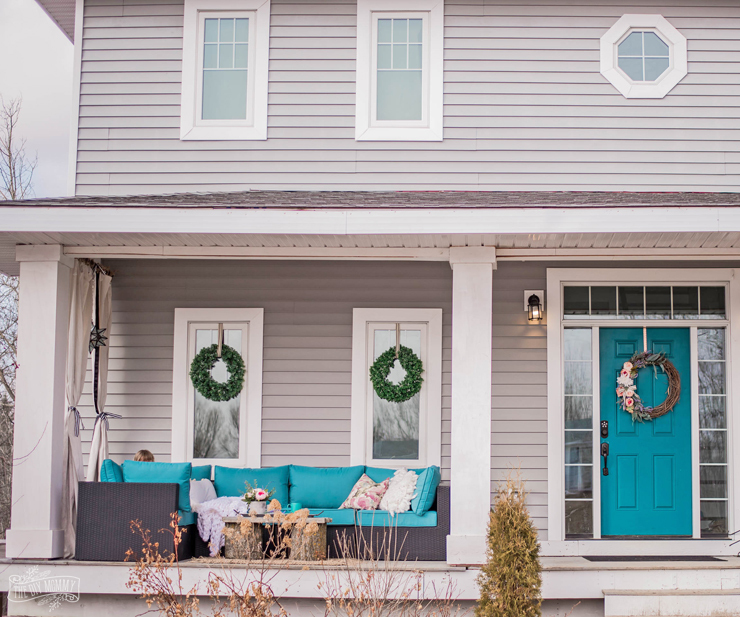 I’m so happy with how our colourful, modern French Country porch has turned out and we’re excited to use our new sectional LOTS this year! We’re planning on finally flooring our porch and building some proper stairs this summer, so the whole effect will be wonderful. Little B has already claimed the couch as hers, and I admit it’s the best spot to snuggle! And at night? So magical! 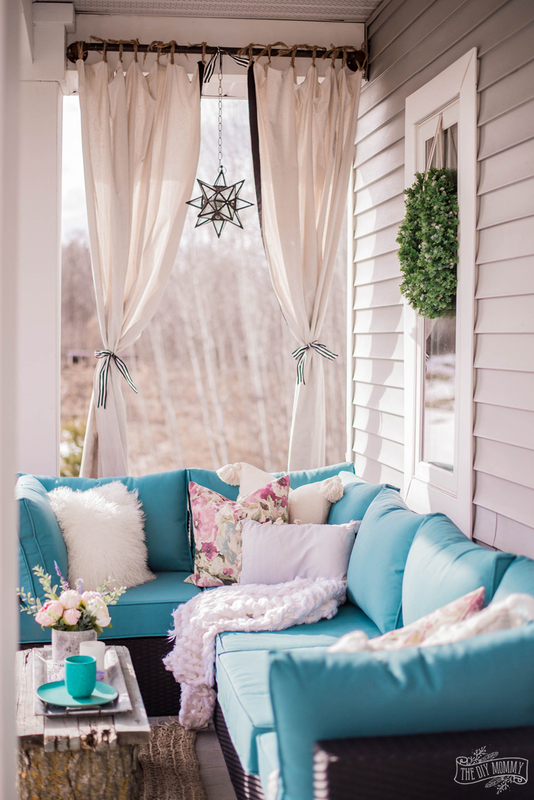 Now tell me: How do you decorate your porch in the early Spring? Do you use faux greenery or flowers or wait until you can put out real ones? I love everything about this front porch! It’s beautiful and makes it feel like spring!